MAMAMOO to hold their fourth solo concert '4th Season F/W' on April 19 to 21. Girl group MAMAMOO will come to the concert in April with a solo concert that will cover all four seasons. 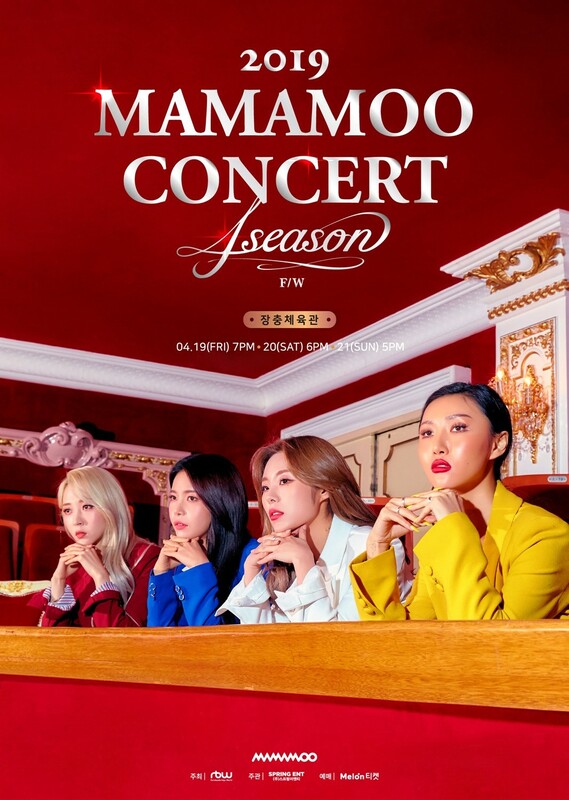 MAMAMOO CONCERT's "4 Season F/W" poster was released on their official SNS at 2:00 p.m. 18th. to announce fourth solo concert. According to the report, MAMAMOO will hold a three day solo concert at Jangchung Gymnasium in Seoul from April 19 to 21. MAMAMOO The solo concert '4 season s/s' held in August last year 10 months. the previous "4Season S/S" had expressed a spectacular and hot spring and summer as the beginning of the "4season F/W" plans to reinterpret the deep seated fall and winter into unique MAMAMOO's style, as well as decorate the colorful finale of the "Four Season Four Color Project." In addition, through "4season F/W," Mamamoo will show their true value as a "performance girl group" by boasting her colorful performances and outstanding singing skills, as well as her creative and pop-up performance planning skills. Starting with their mini-album "Yellow Flower" released in March last year, Mamamoo has been running the "Four Season Four Color Project" since then, unveiling "Red Moon" in July, "Blues" in November and recently "White Wind." By utilizing symbolic colors and seasons of each member, the group's identity was saved and its brand value was raised, which received many favorable reviews. MAMAMOO's solo concert "4Season F/W" will be held at Jangchung Gymnasium in Seoul from April 19 to 21, pre sale of fan clubs at 8 p.m. April 25, and general reservations at 8 p.m. on April 27.